3 products you need for the bank holiday. Even though I was on holiday last week, I feel like I need this bank holiday. It definitely feels like it has been a long time coming – why so many bank holidays and then none for the summer? I’ve got a quite a packed weekend that obviously involves lots of eating and playing with makeup as well so I’m looking forward to relaxing. After this weekend we wait until Christmas? What even. Essentially, what I’m trying to say is that I am ready for the three day weekend. For the 3 days I think there are 3 products you definitely need to make sure the mini holiday is spent enjoying yourself and looking all chic and amazing without trying. Well, in theory. A tinted moisturiser that makes your skin look silky smooth. A tinted moisturiser has the awesome advantage of evening out your skin and making everything look polished but without looking like you’re wearing a lot of makeup. 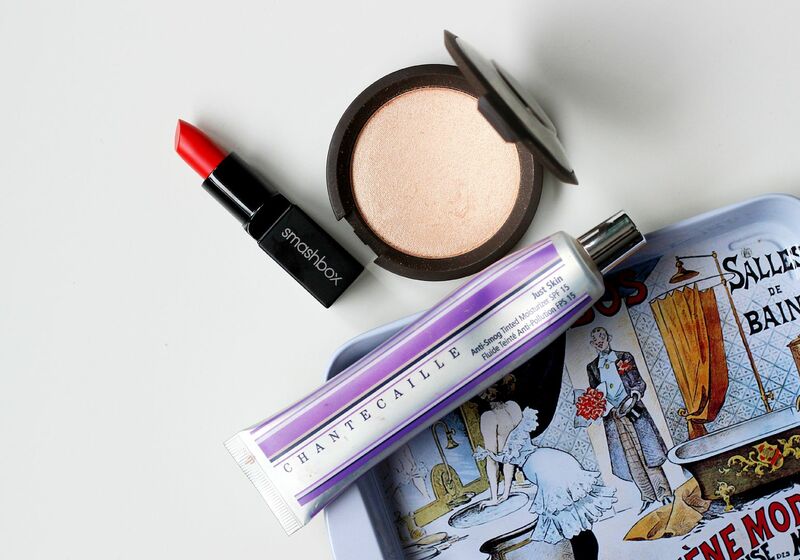 The Chantecaille is the creme de la creme of glowy skin. A highlighter that makes your cheekbones look like they’re diamonds. Apply loads and then apply some more because you’ll probably be drunk. Maybe. Pictured here is the BECCA x Jaclyn Hill delight. This looks so pretty in photographs and lasts all day. Not for those with an aversion to shimmer. Who are those people? How awful. A bright red lipstick that makes you look awake and zingy. Some obvious choices are MAC Lady Danger, Illamasqua Soaked, Estee Lauder x Kendall Jenner… I’ve gone for the Smashbox fireball matte lipstick. So lovely and so essential. Nothing is as amazing as an orange red lipstick. I’m right, you know I am.